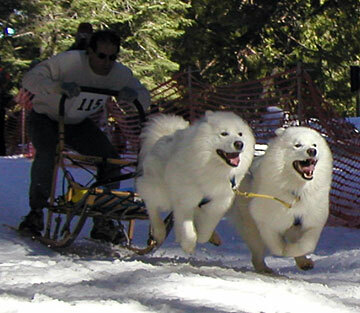 Lightning (right lead) and Nimbus (left lead) are teaching Paul how fun it is to race with a dog sled. We had two fairly good runs at this race. Day 1 - Paul’s sled bounced off the side banks about 100 times (the course grooming device left a crown down the center), but the team still averaged 15 mph. We shocked the crowd by being the first team to the finish line. Day 2 - Paul only hit the sides 20 times so we averaged 15.9 mph. We took 4th Place overall out of ten teams. 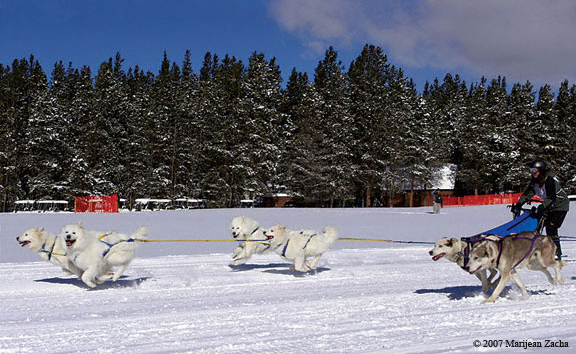 The best part was at the finish line where the crowd was amazed to see a two-dog team keeping right in time with all the 3-dog Alaskan Husky teams. 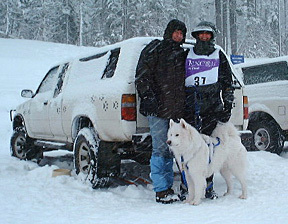 The 2004 Shaver Lake Sled Dog Race was Paul’s first experience driving the team at a race. Temps were around 50F degrees, and the course was slushy, steep, and very rough. 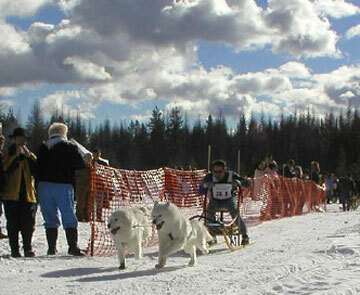 Experienced mushers said it was the toughest race course they had ever run. Lightning (right lead) and Nimbus (left lead) placed 2nd in the 3-Dog class. 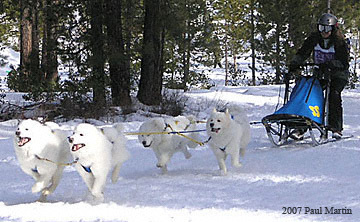 First place went to a well respected musher who usually wins several classes on the California circuit. 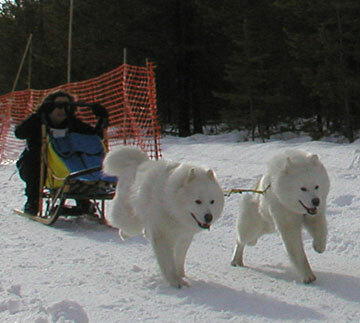 Even though she ran a team of three Alaskan Huskys, our 2-dog Samoyed team beat her on the second day! Although this was not quite enough for us to overcome the edge she had from the first day, it was a very impressive showing. 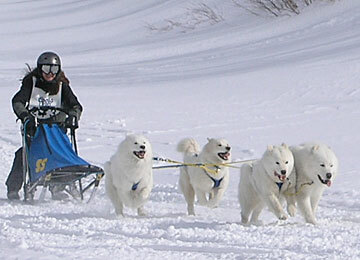 Paul and the boys earned tremendous respect from her and the other mushers. 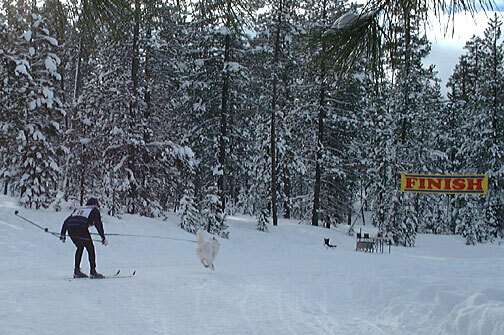 Lightning sailed along the 2.6 mile Novice Skijor course at the 2002 Chemult Sled Dog Races. Partnered with Paul, our team averaged 9 miles per hour over the two day (5.2 mile total) event. 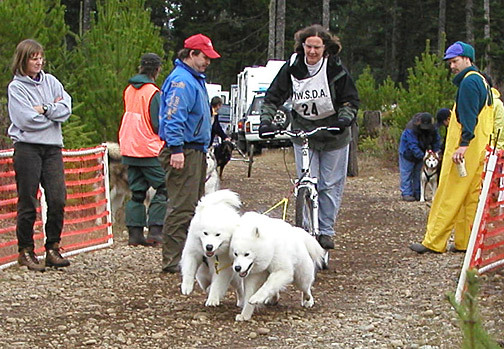 Lightning was the only single-dog entry, and still came in 2nd Place, beating 2-dog Alaskan Husky and Alaskan Malamute teams. Conditions could not have been nicer, and fun was had by all.